If you imagined that this adaptation of Charlotte Bronte would be a stuffy affair then you'll be in for a shock. This National Theatre production of the Victorian drama is packed with an innovative yet minimalist set, physical theatre and a live band, there is plenty to admire in this production. Given the numerous locales and different time periods that the story is set in as well as the epic scale of the story, it is some achievement to pull off all of this. But to do with essentially one set and a handful of actors speak volumes for the quality of this production. But the set by Michael Vale is ingenious, based on several different levels. Striking enough on its own but when all the production elements come together, it effortlessly transforms from all of the locations. There is also a lot to admire in the acting as aside from Nadia Clifford in the title role and Tim Delap as Rochester, everyone else plays multiple characters and portray them very well. There is a lot to like about Clifford as Jane Eyre, especially as she plays the character through childhood and adulthood. The other thing to mention is the music, played live and creating the perfect atmosphere for the show. Perhaps surprisingly as well, music is used and there are plenty of modern and recognisable tunes for people to spot. This comes to prominence during the show's climatic sequences and Melanie Marshall as the singer has a stunning voice. Confession time, I am not a massive fan of the story or Victorian period drama generally and while this production didn't change my view of the story too much, I was thoroughly impressed with the production and suspect that there will be a lot for fans of the book and newcomers to the story to admire. 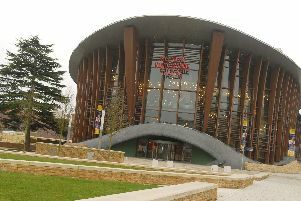 Jane Eyre can be seen at Aylesbury's Waterside Theatre until Saturday April 29. Tickets can be booked by calling the box office on 0844 871 7607 or by visiting www,atgtickets.co.uk/aylesbury.